About every 26-months, Earth and Mars get a good look at each other as their orbits cause them to line up together on the same side of the Sun. At the instant that Earth is between Mars and the Sun we have “Mars Opposition” — Mars is opposite the Sun in Earth’s sky. 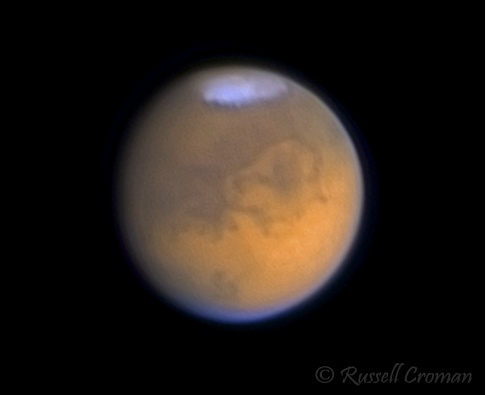 Mars is closest to Earth around this time and amateur astronomers make a point of observing it. 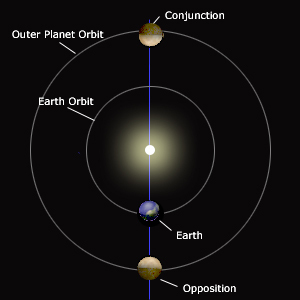 Not all Mars oppositions are created equal: due to the oval shapes of Earth’s and Mars’ orbits, the distance between them at opposition can vary. For instance, the famous 2003 opposition had the two planets come within 34.6-million miles / 55.8-million kilometers of each other. The news media, at the time, made it known that this was a once-in-a-lifetime event: the two planets had not been this close in 60,000-years. This resulted in long-lines at scopes set up for public viewing. On the other-hand, for the 2012 occurrence of the same event, there were no lines at the scopes: opposition distance between us and the fourth planet was almost double that of 2003: 62.6-million miles / 100.8-million km. 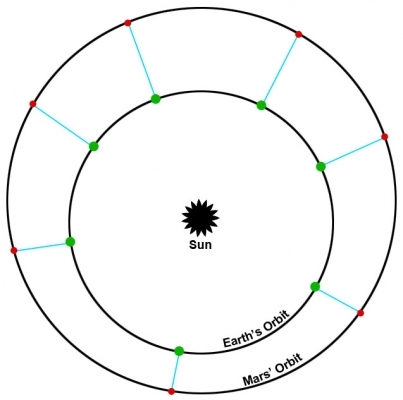 Earth and Mars orbit diagram showing how the opposition distance (blue lines) between the planets (Earth = green and Mars = red) can vary greatly depending on where in their orbits the opposition takes place. But this year the lines may be back: on July 27, 2018, Mars will be in opposition at a distance of 35.9-million miles / 57.8-million km — not far off from the 2003 distance. Due to orbital eccentricity, Mars and Earth continue to draw ever-closer after the 2018 opposition, with the distance shrinking by another 111,000-miles / 179,000-km when they are nearest on July 31, 2018. The Association of Lunar and Planetary Observers notes that “Mars will exceed 24-arc-sec in diameter between July 23rd and August 9th, 2018. This is 97 percent of the maximum of 25.13-arc-sec diameter attained during the last of the ‘favorable’ apparitions, which occurred in 2003.” This means you should be out observing Mars in the weeks prior to and after the opposition. When Tele Vue was considering the characteristics of a superior “planetary” eyepiece, a zoom feature was found to be essential in obtaining “the highest possible useful magnification on a given night considering the ever-changing atmosphere.” The result of this study was the Nagler 3-6mm Planetary Zoom: an eyepiece with full field sharpness for any speed telescope, high contrast and transmission for natural color rendition, low scatter, comfortable eye-relief, with adjustable magnification to match the seeing conditions that can change a lot over the course of an observing session. There are Powermates™ for 1¼” and 2″ eyepiece adapters. If you have a favorite eyepiece that lacks the power for planetary usage, consider our Powermates™: they are the solution for any scope to achieve the long focal-length required to see details on planetary bodies. Powermates™ increase the effective focal length of your scope without introducing any new aberrations into the system. 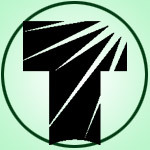 They are available in 1¼” barrels (2.5x & 5x) and 2″ barrels (2x & 4x) and can be stacked (e.g. : a 2x and 4x Powermate™ will increase focal length by 8x) to allow nominally “low-power” eyepiece to reveal planetary details. (Tele Vue recommends maximum magnification of 60x / inch (2.5x / mm) of telescope aperture and 350x maximum regardless of aperture.). Powermate T-Ring Adapter for 2x 2″ Powermate™. The benefits of Powermates™ extend to imaging: some of the finest Solar System images have been made with Powermates™ . This requires an optional Powermate™ T-Ring Adapter that allows a Powermate™ to connect with any T-Ring equipped camera. A Powermate™ with the adapter can by used singly or stacked with another Powermate™, to achieve the long effective focal-length required for planetary imaging. For those readers in southern South America and the Antarctic, they’ll be a partial solar eclipse tomorrow. See our eclipse preview blog post for more info. Sky & Telescope Mars Profiler tool shows you a rectangular map of Mars accurate for any date / time. Note: this tool is a pop-up, so you must allow browser pop-ups else you won’t see the tool at all. You’ll be able to touch an feel all our eyepieces, Powermates, scopes, mounts, and accessories at the yearly spring NEAF show in NY. Previous Previous post: European Astrofest 2018!